Firmamentum, a division of Tethers Unlimited, Inc. (TUI), announced that it has signed a contract with Space Systems Loral (SSL), a leading provider of innovative satellites and spacecraft systems, to prepare a flight demonstration of in-space manufacture of a component on a communications satellite. Firmamentum’s in-space manufacturing hardware is intended to fly as part of SSL’s “Dragonfly” program, which will demonstrate in-space robotic assembly of geostationary (GEO) communications satellites, enabling dramatic improvements in GEO satellite performance and mission flexibility. The Dragonfly program is funded under NASA’s Space Technology Mission Directorate’s (STMD) Tipping Point initiative to work with industry to advance the goals for robotic and human exploration of the solar system through the development of critical space technologies. In May, 2016, Firmamentum, a division of Tethers Unlimited, Inc. (TUI) dedicated to developing in-space manufacturing and construction services, announced that had signed a contract with DARPA to design a persistent geostationary orbit (GEO) satellite platform. Under the “Constructable™ Platform” Small Business Innovation Research (SBIR) award, Firmamentum will collaborate with Space Systems Loral (SSL), NanoRacks LLC, and Vulcan Aerospace to develop a modular architecture for constructing stations in Earth orbit capable of supporting multiple government and commercial payloads. Firmamentum’s Constructable approach entails launching suitcase-sized modular elements at low cost using DARPA’s PODS payload delivery system and then robotically assembling these modules to form a space station in GEO capable of providing power, communications, stationkeeping, and other key services to ‘tenant’ payloads. Firmamentum’s technologies for manufacturing satellite components such as trusses and reflectors on-orbit will enable integration of these small modules to form large, stable platforms that can grow and evolve to meet the needs of many different payloads over multiple decades of operation. Firmamentum is a division of Tethers Unlimited, Inc. (TUI) established to develop an ecosystem of in-space manufacturing and construction services to build the infrastructure needed for a robust in-space economy. Firmamentum is currently preparing flight demonstrations of in-space recycling as well as in-space manufacturing of satellite components. TUI, founded in 1994 by Dr. Rob Hoyt and Dr. Robert L. Forward, develops transformative technologies for Space and Defense missions. Its technology portfolio includes advanced space propulsion systems, programmable radios for small satellites, and additive manufacturing technologies. 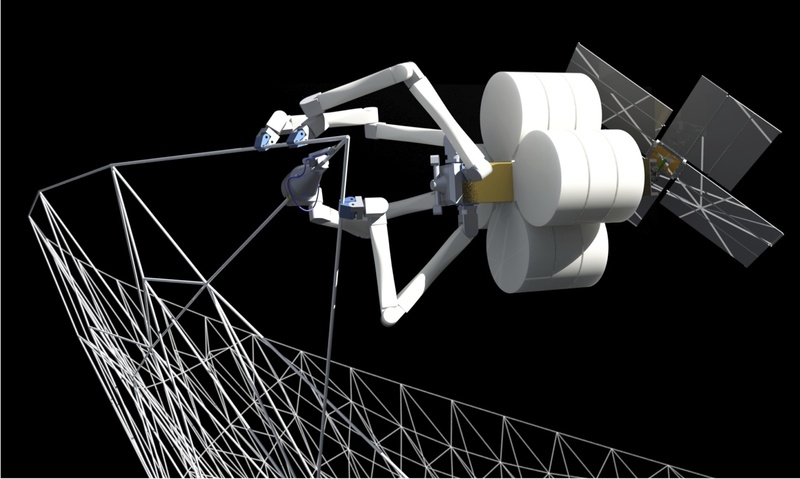 TUI is currently developing a revolutionary suite of technologies called “SpiderFab” to enable on-orbit fabrication of large spacecraft components such as antennas, solar panels, trusses, and other multifunctional structures. SpiderFab provides order-of-magnitude packing- and mass- efficiency improvements over current deployable structures and enables construction of kilometer-scale apertures within current launch vehicle capabilities, providing higher-resolution data at lower life-cycle cost.